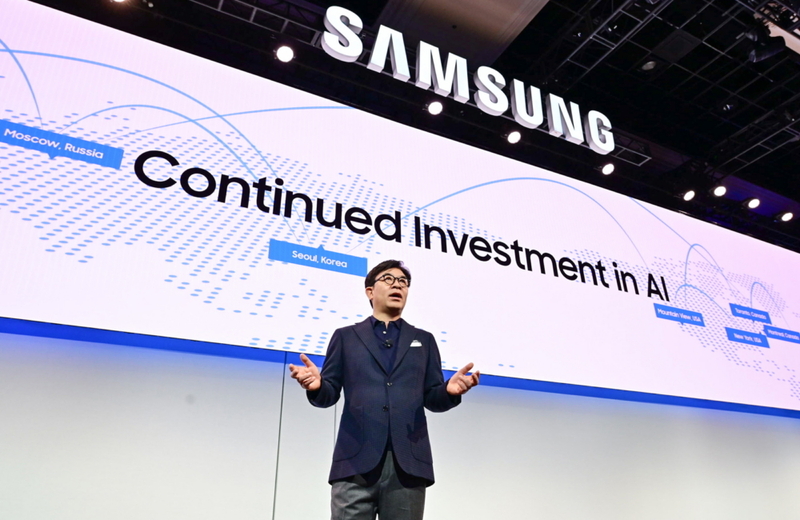 Samsung Electronics today announced how the company’s investment and leadership in AI, IoT, and 5G technologies will serve as the building blocks for its vision for Connected Living. The company also unveiled its future AI-powered robotics platforms, which can be used to manage activities of daily living, such as helping an aging population independently manage their health routine. HS Kim, President and CEO of Consumer Electronics Division, Samsung Electronics gives his opening remarks, welcoming guests to Samsung Electronics’ CES 2019 Press Conference. Samsung leveraged its telecommunications leadership to make major strides in bringing 5G connectivity to consumers. Samsung is the number one patent holder with ETSI1, having registered more than 2,000 5G essential patents as of November 2018. And it is the world’s first company to receive FCC approval on its commercial 5G equipment. The company powered the commercialization of home and mobile 5G networks with major U.S. carriers and all three mobile carriers in Korea, with additional trials running in Europe and Asia. Samsung is also committed to putting the power of 5G in consumers’ hands, with a 5G smartphone coming in the first half of 2019. Bixby started as a smarter way to use your Galaxy phone. Today, it is evolving to become a scalable, open AI platform that will support more and more devices. The company announced that Bixby intelligence will be infused into its 2019 QLED and premium TVs, and smart appliances like refrigerators, washers, as well as air conditioners, mobile devices, AI speakers and more. What’s more, Bixby is expanding to a new Digital Cockpit and robotics platforms. 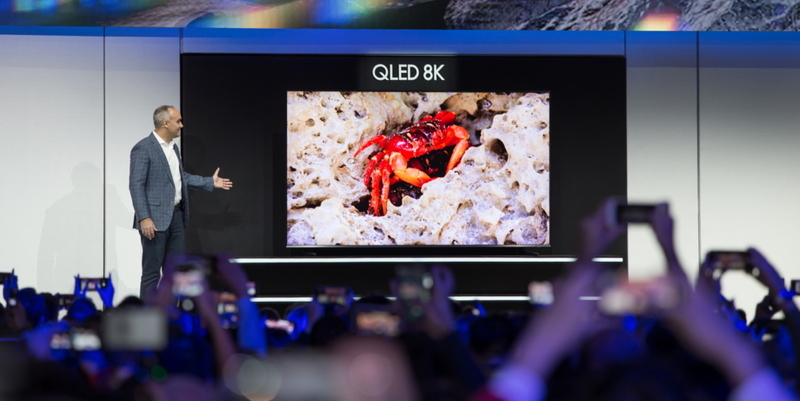 Dave Das, Senior Vice President of Samsung Electronics America, unveils the 98-inch QLED 8K. 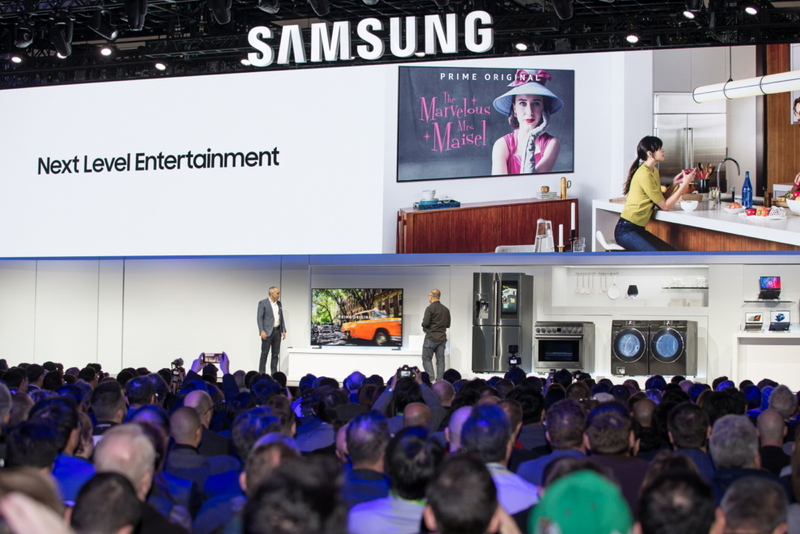 (From left) Dave Das, Senior Vice President of Samsung Electronics America and Yoon Lee, Senior Vice President of Samsung Electronics America, demonstrate the Universal Guide with new Bixby on a 2019 Samsung Smart TV. Family Hub 2019 is more intuitive and intelligent than ever before. The new Family Board offers a completely redesigned screen experience, letting family members communicate and share memories in a creative space on the front of the fridge. Honored with a CES 2019 Innovation Award, Family Hub 2019 with the new Bixby lets users interact in natural language to get answers to complicated questions, preset the oven, search for recipes, and even call an Uber. In addition, Bixby visually shows you information on the screen for a richer experience and displays an array of visual information. These new features will also be available via automatic update for most earlier Family Hub models. 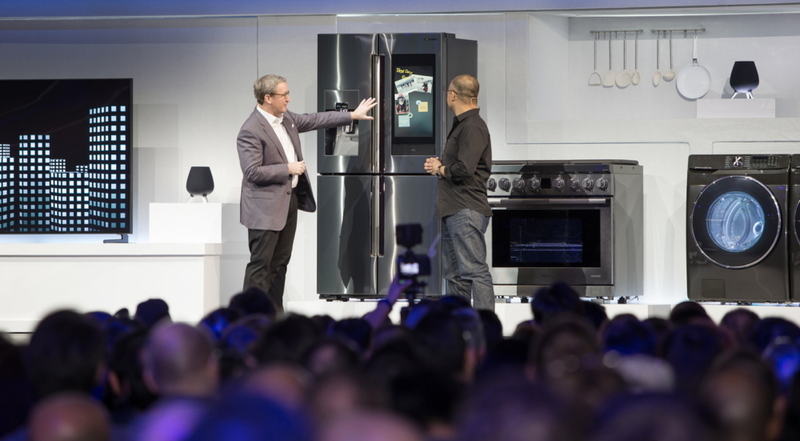 (From left) John Herrington, Senior Vice President, General Manager of Home Appliances, Samsung Electronics America and Yoon Lee, Senior Vice President of Samsung Electronics America, demonstrate Family Hub’s enhanced AI and IoT capabilities during Samsung’s CES 2019 press conference. The new front load washer, also a 2019 CES Innovation Award winner, can finish a full load in just 30 minutes2 with the SuperSpeed feature. With Bixby, users can also control its smart features like getting recommendations for the best wash cycle, scheduling a cycle to be completed at a users’ preferred time, automatically connecting the dryer cycle when the washer is done, or monitoring usage to efficiently manage their laundry appliances. Samsung revealed a line of new, innovative products that combine productivity and flexibility to help consumers get things done more conveniently. The redesigned Notebook 9 Pro is engineered for on-the-go modern professionals to help them reach their true creative potential, while the Notebook Odyssey gaming laptop, powered by the new high-end NVIDIA® GeForce RTX™ 20-series GPU, is ready for both work and play. Samsung Space Monitor leverages its sleek design and functionality to allow users to focus on what’s on the screen and not what’s around it. Its unique built-in space saving solution, a minimalist, fully-integrated clamp stand that grips to the desk, tilting back and forth to free up space for optimal user productivity. Beyond aesthetics, Samsung’s Space Monitor is a feature-rich, high-performance monitor. The 27-inch model offers QHD resolution for incredibly detailed, sharp images, while the 32-inch model presents content in 4K UHD. With the integration of Bixby’s connected car experience, drivers can remotely check how much gas they have before going on a long road trip or set the car temperature before heading out for the day. Using onboard cameras, the new Digital Cockpit recognizes specific drivers and passengers and sets up the car’s personal space accordingly – adjusting the display preferences, seat height, lighting, and queuing up favorite playlists. Passengers can even enjoy personalized screens on the rear seats and connect to In-vehicle Samsung DeX to get work done on-the-go. The Digital Cockpit 2019 also provides a safer driving experience with the mirror replacement vision system and camera-based safety solutions. 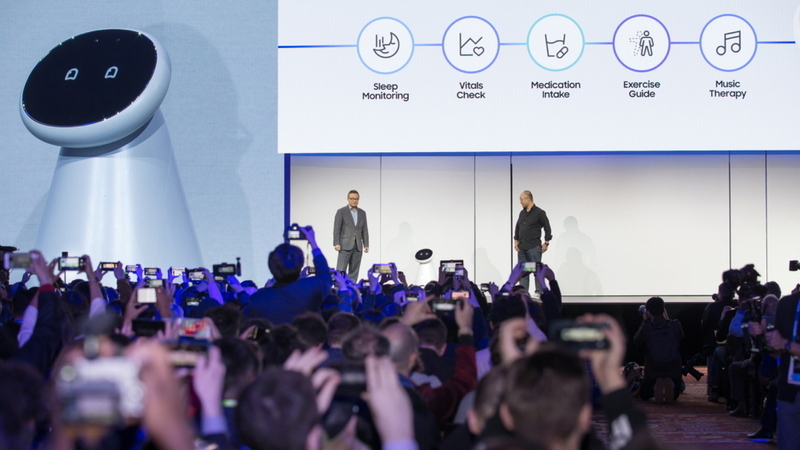 Geunbae Lee, Head of the Samsung AI Center, joins Yoon Lee on stage to introduce the crowd to Samsung Bots, which combine the company’s latest advancements in robotics platforms, hardware, software and AI technology. The speakers demonstrated how Samsung Bot Care, pictured here, helps users manage their daily health routines. 2 Based on using SuperSpeed on a Normal cycle with an 8lb load.